Daniel H. Erskine received his graduate legal training at The George Washington University Law School where he earned an LL.M. (or Master of Laws) in International and Comparative Law. As part of his LL.M. program, he studied International Human Rights and Refugee Law at New College, Oxford University in the summer of 2005. Attorney Erskine’s thesis entitled Reforming Federal Personal Injury Litigation by Incorporation of the Procedural Innovations of Scotland and Ireland: An Analysis and Proposal presented a new method for litigating personal injury cases in United States federal courts. The Cardozo Journal of International and Comparative Law published Attorney Erskine's thesis as the Lead Article in the Winter 2007 edition of the Journal. In addition, Attorney Erskine's independent research project focusing on the dispute between the United States and the European Union over European customs rules and regulations was published as the Florida Journal of International Law's lead article in 2006. Attorney Erskine completed his undergraduate legal education at Suffolk University Law School where he earned his Juris Doctor degree. After earning a staff position on the Journal of High Technology Law, an honor board, Attorney Erskine was elected as the Content Editor of the Journal for the 2002-2003 publication cycle. Attorney Erskine’s student note entitled Satellite Digital Audio Radio Searching for Novel Theories of Action and his book review entitled A Review of Raymond R. Coletta’s Biotechnology and the Creation of Ethics were selected for publication in the Journal by his peers. Attorney Erskine also earned the Harold Goodwin, Jr. Legal Advocacy Scholarship and Best Advocate Award. During Attorney Erskine's first year of law school, and every subsequent year, he competed nationally as a student attorney on the school’s mock trial teams. Attorney Erskine concluded his third year of law school by winning the school's intrascholastic mock trial competition. Finally, Attorney Erskine completed studies in Public International Law and Comparative Constitutional Law in London, England during the summer of 2001. Granted advanced standing and advanced placement, Mr. Erskine earned a bachelor’s degree with a double-major in political science and philosophy from Boston College in three years. Mr. Erskine also represented the College as a member of Men's Foil Squad on the school’s Division I Varsity Fencing Team. He received Athletic Director's Awards for Distinguished Academic Achievement as a Varsity Athlete each year of his membership on the Team. Mr. Erskine was also admitted to the Golden Key National Honor Society and the Phi Sigma Tau National Honor Society in Philosophy. Permitted by the College's faculties of Political Science and Philosophy, Mr. Erskine undertook graduate courses in each department as an undergraduate student. He completed a senior independent research project on the Scottish Parliament, which resulted in a one hundred plus page paper on the Parliament's history and modern day procedural structure. Mr. Erskine later returned to Boston College as a Special Graduate Student in the Philosophy Department. Immediately upon graduation from law school, Attorney Erskine served as the Compliance Manager for a small business involved in the international and domestic relocation of industrial production facilities as well as individual product lines. After Attorney Erskine was admitted to the practice of law, he assumed the role of counsel for the company. While completing his graduate legal education in Washington, D.C., Attorney Erskine was selected for a judicial clerkship at the Superior Court of the District of Columbia. His clerkship focused on the area of child abuse and neglect in the Family Court of the Superior Court of the District of Columbia, a statutory model court created by the U.S. Congress through the District of Columbia Family Court Act of 2001 (P.L. No. 107-114, 115 Stat. 2100). After completing his clerkship and graduate legal studies in Washington, D.C., Attorney Erskine entered into the private practice of law in New York State. In 2007, to better serve clients, Attorney Erskine established an office in Connecticut. He currently practices law in both New York, from his office in Mount Vernon, and in Connecticut out of his New Haven office. Attorney Erskine delivered papers at both international and domestic academic conferences. His law review articles on various subjects addressing domestic, comparative, and international law were published by nationally known academic journals. His opinion pieces appeared in The National Law Journal, an award winning weekly newspaper of the legal profession. Attorney Erskine also appeared on national television as a commentator in his role as an international attorney. From 2007 to 2009, Attorney Erskine served as an appellate attorney who litigated appeals in child abuse and neglect proceedings for indigent clients by appointment from the Connecticut Commission on Child Protection. Mr. Erskine holds an LL.M. in International & Comparative Law (2006) from The George Washington University Law School, a J.D. (2003) from Suffolk University Law School where he served as the Content Editor of the Journal of High Technology Law as well as received the Harold B. Goodwin, Jr. Legal Advocacy Scholarship & Best Trial Advocate Award, and a B.A. in Political Science & Philosophy (2000) from Boston College, which granted him Advanced Standing and Advanced Placement in addition to membership in the Golden Key National Honor Society, the PHI SIGMA TAU (national philosophy honor society), as well as Athletic Director's Awards for Distinguished Academic Achievement as a Varsity Athlete (Men's Foil Squad, Division 1 Fencing). Attorney Erskine is an attorney licensed in New York and Connecticut as well as a solicitor of the Senior Courts of England and Wales with offices in Mount Vernon, New York, Westchester County & New Haven, Connecticut, New Haven County. 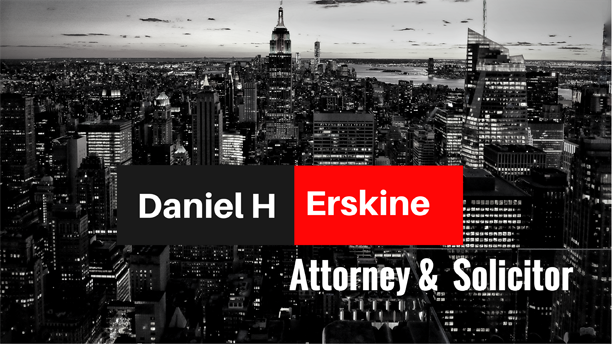 Daniel H. Erskine, a New York and Connecticut admitted attorney and solicitor of England and Wales, represents U.S. individuals, companies, joint ventures, foreign businesses, and foreign nationals on complex legal matters under U.S. and U.K. law. Prior to entering private practice, Mr. Erskine served as a shareholder and counsel to a business involved in relocating large scale production facilities from either US or foreign locations. Mr. Erskine also completed a judicial clerkship at the Superior Court of the District of Columbia in Washington, DC. He now operates a solo practice focused on international business transactions, advising on US and English law, representing foreign and domestic small and medium sized companies (SME), specialty subcontractors, high technology enterprises, and senior executives. The transactional side of Mr. Erskine's practice involves composing bespoke cloud (SaaS, IaaS, PaaS, DaaS, DPaaS, BaaS, EULA, ASP, maintenance, support, reseller, distribution), traditional software licenses, storage, services, data protection/security, hosting, consulting, back-up/recovery, and marketing agreements under English and US law for foreign and domestic SMEs manufacturing bespoke software. On the advocacy side of his practice, he represents foreign and domestic parties in defense and prosecution of their civil claims in New York and Connecticut state courts as well as in appeals at the state level. Mr. Erskine previously served as an appointed appellate advocate in Connecticut to prosecute appeals about abused and neglected children. Additionally, Mr. Erskine is the author of seven published law review articles (three as the lead article) on diverse areas relating to international legal topics, including WTO issues related to the European Community Customs Code, foreign legal procedural devices, and comparative constitutional analysis of fundamental rights.